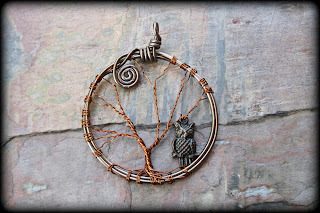 I just opened a new Etsy shop for all of my wire-wrapped trees and bird nest pendants............ and to kick off the grand opening of The Twisted Willows I want to giveaway a piece to my lovely readers! It's super easy to enter this giveaway. Simply visit my new shop The Twisted Willows and leave me a comment here telling me about another tree/nest that really catches your eye! I'll choose a winner at random on June 1, 2011. Entrants must live in the USA or Canada! So pretty! I really like the one with the citrine stones and owl charm. Added The Twisted Willows to my favorites. I follow GGG through GFC. 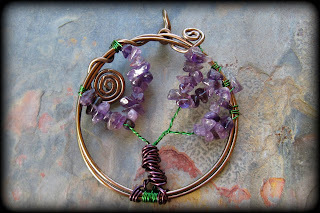 I love the wire wrapped tree pendant with gemstones and the green frame! Lovely use of pretty delicate stones! I like the Tree with Pink Quartz Gemstones! I like the Large Wire-Wrapped Tree Pendant - Ready to Ship. I love the Wire Wrapped Tree with Czech glass! Thanks for the great giveaway! Hearted your shop! Love the name! I love the Large Wire-Wrapped Tree Pendant. I like Wire-Wrapped Tree Pendant with Stones. I added you to my favorites. Thanks! These are beautiful pendants! I like the Wire-Wrapped Tree Pendant. It all catches my eye! But I really like the Wire-Wrapped Gemstone Tree with Owl . I follow this blog via gfc as hrhersch. I <3 your etsy shop as hgardner16. My favorite item is the Wire-Wrapped Bird Nest Pendant. Its beautiful! i really love the wire wrapped gemstone tree pendant in Pink Quartz! I also like the Wire-Wrapped Gemstone Tree with Owl. I follow via Google friend Connect as nightowl. I added your store to my Etsy favorites.